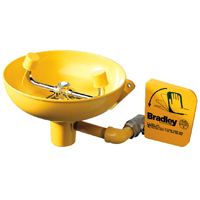 Eye wash Stations are among the most important safety fixtures in facilities where hazardous debris and chemicals can get into people’s eyes and harm them. If a person gets a hazardous substance in his or her eye, the station will immediately deliver a stream of water to the eyeball and wash the hazardous fluid or debris out of the eye socket. Sometimes only seconds are available for the person to reach the station and rinse the eye before serious, or even permanent, damage is done. Because this is such a time critical issue, eye wash stations must strictly comply with a number of safety codes, among which are ANSI z358.1-2004 and OSHA codes. They must also be easy for workers to locate, even if they have been partially blinded by something that has gotten in their eyes. For this reasons, fixtures are tested and tagged much like fire extinguishers so there will be no doubt as to their location, and no delay in getting to the station. 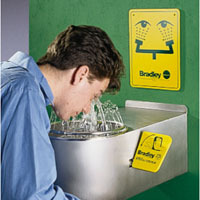 There are a number of facilities and organizations that use eye wash stations. Factories install them anywhere dust or chemicals could get in workers’ eyes. Chemical plants also install them anywhere liquids or strong fumes can irritate and burn eyes. Laboratories must use them to sanitize eyes exposed to experimental chemicals and substances. Hospitals use them for sanitizing eyes that may have been exposed to fluids or chemicals related to patient care. Dentists must also use them because tooth debris can get into eyes and damage tissue if not washed out. Not only do these emergency relief stations protect human welfare, but they also save organizations millions of dollars each year by averting workman’s compensation claims and possible lawsuits. They also help architects and builders meet code by ensuring that the work environment will be as safe as possible even in situation where things can and sometimes do go terribly wrong. The pedestal design is intended to save space in close quarters. Unit activates by a large, high-profile push handle. 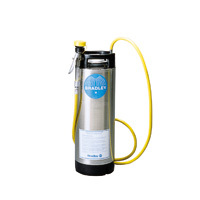 Water pressure ranges from 30-90 PSI. The eye wash station actually resides in a recessed cabinet fitted into a wall. This is a super space saver for very small areas. 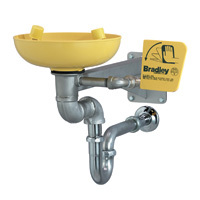 This is another cabinet mount design where the spray mounts stand vertically flush with the cabinet while not in use. To activate, the user swings the station down so the water can jet upward into the eyes. These units stand upright in places that cannot hold wall mounted units. They provide a deluge of water when the operating handle is pulled. Persons using this type of eye wash fountain stand under the water stream so both the eyes and face are cleansed of hazardous material. Some designs mount to standard and gooseneck faucets. The water is diverted from the faucet to the station heads when the unit is activated. For places where workers move around a lot, or where permanent fixture housing is impractical, a variety of portable stations are available for emergency use. Wall mount units are also manufactured in a number of barrier free designs. Barrier free simply means that the unit is specifically designed with ADA compliant features, including a minimum of 30 PSI water pressure, are required features of these product lines.